Mahendra Singh Dhoni’s daughter Ziva Dhoni is winning hearts off the field with Chennai Super Kings. Dhoni’s adorable daughter is a regular fixture with the team, wherever they travel. She was with with the team at Eden Gardens where they defeated Kolkata Knight Riders. 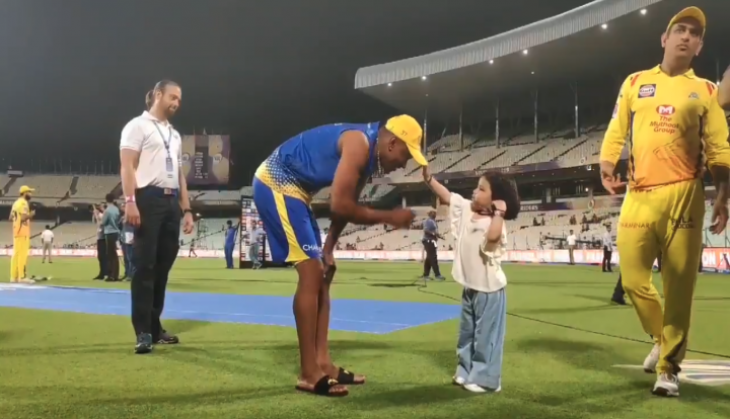 Ziva was seen teaching Dwayne Bravo the correct way to wear a cap. She was talking with at great length and was showing him with actions. Ziva Dhoni also gave an award to Imran Tahir which he already received at the post match presentation. Tahir was happy to receive it again by adorable Ziva. Imran Tahir was awarded the man of the match and game changer of the match trophies for his amazing bowling figure of 4-27. Suresh was also the star performer for Chennai as he scored a fantastic half-century and contributed with Ravindra Jadeja at the end to win the match. Chennai Super Kings won the match by 5 wickets as they beat Kolkata Knight Riders at their home to maintain their ranking on the points table. Chennai Super Kings have four more points than the number two team Delhi Capitals. CSK have 14 points as they played eight matches and won seven of them. The only one they lost was against Mumbai Indians at Wankhede. Chennai Super Kings will play against Sunrisers Hyderabad on April 17 at Rajiv Gandhi International stadium. SRH will desperately want to win the match as they lost four consecutive matches and CSK on the other hand will look to continue their winning streak.